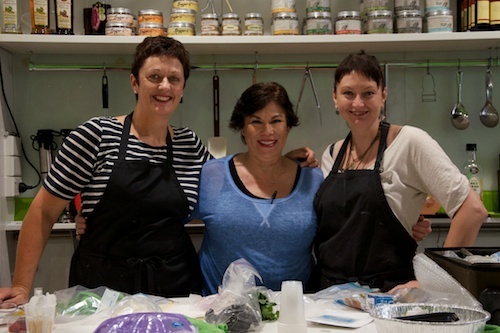 I arrived back from Australia a few days ago with my head reeling from a weekend workshop at the Sydney Cooking School. I’m still not quite sure what to make of it but I discovered a side of the food business that has nothing to do with creating good tasting food – food styling is all about making inedible stuff look tasty. And man, there is such an art to doing it well! 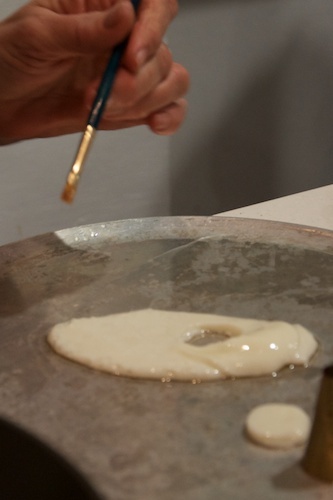 The weeekend workshop was run by Denise Vivaldo, an American/Italian based in Los Angeles. She was in Sydney at the recommendation of my friend Harriet Harcourt, a cook and a food-stylist who lives in Perth. Harriet helped organise the course and told me I should sign up – you’ll love it, this woman is brilliant. And she is. She is warm, funny and hugely entertaining. More to the point, she has written the bible of food styling based on 25 years of experience tricking up food for televison, film, cookbooks and multi-national food companies. 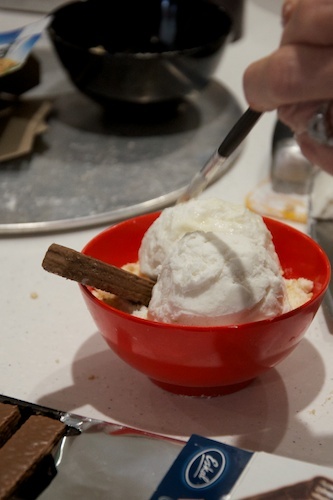 And she is so good at it that during her Sydney course I found myself salivating over food that may well have killed me. It’s true. The crushed ice in a refreshingly cool looking cocktail came from a jar marked poison. Nearly as bad, I licked some delicious looking caramelised chicken juice off my hand before realising it was the brown stuff I’d been using to paint a raw chicken. The thought of salmonella had me sluicing my mouth out with what I hoped was fresh water. Painting raw chickens to make them look roasted was just one of the mind-bending exercises I worked my way through on this eye-opening course. My chicken was only so-so but I did quite a good job of making a pre-prepared Weight Watchers risotto look reasonably appealing. This is not something I’d ever have to do in my professional life but big food companies pay big money for this sort of thing and I suspect my fellow students had ambitions in this area. I was more interested in making food look attractive for my blog or the occasional magazine recipe and I’m happy to say I now have quite a few tricks up my sleeve. 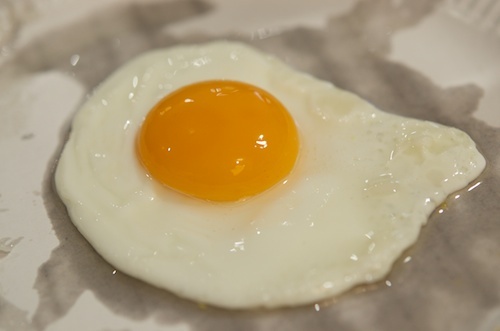 I know how to do a “pizza pull” so you get those yummy strands of mozzarella looking just right, I can present a perfect fried egg and I know how to get great-looking grill marks on a hamburger bun – an eyebrow pencil fills in the gaps. I’ve discovered how to fake ice cream and cappuccino froth, and I have zillions of uses for Scotch Guard. The problem is, I’m not sure if I can actually bring myself to use all these tricks. I had my doubts during the chicken painting lesson but by day number two I was having a full on ethical attack. Was it honest? I hit Denise up about this. Honey, she said, would you want to be photographed without makeup? Or words to that effect. Well, I rarely leave the house without lipstick at least, so I can see where she’s coming from. We had an interesting discussion – she’d obviously given it some thought – and the upshot is, it depends. It depends on the context and the degree: is it enhancement or falsification? Foundation or facelift? The comparison with makeup and fashion photography is a good one. We know the clothes have been altered for a perfect fit on the model and we know the cosmetic pics have been airbrushed – we accept it because it makes for a great looking photograph and even ‘though we know we won’t look as good if we wear that dress or that lipstick, it gives us something to aspire to. 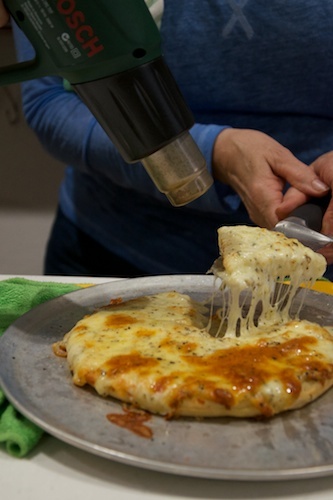 Food photography works the same way – it has to look better than it does in real life. 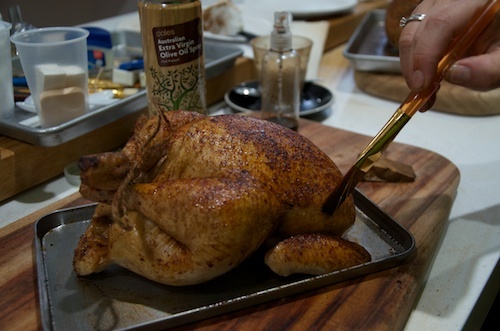 That’s why we learned how to paint a ‘roast’ chicken. A real roast chicken doesn’t look half as good when it’s photographed: partly because it collapses and looks tired and wrinkly before the photographer has set up the shot, and partly because we can’t smell a photograph so it has to work twice as hard to make us want to eat it. So we stuff it with paper towels to plump it up, give it ten minutes at 180°C to stretch the skin, then paint it with a mixture of gravy browning and food dye. A sprinkle of paprika and and a spritz of oil finishes it off and it will stay looking good for hours. I would also challenge anyone to tell the difference if it had been styled by a pro. Since I got back from Sydney I’ve been examining food photographs in quite a different way, especially the ones you see in advertisements. I now know if I was to bite into one of those high rise hamburgers, the beef would be raw, the buns would be sprayed with scotchguard to make them sauce resistant, the mustard would shine with glycerine and I would be rewarded with a mouthful of pins and make-up pads. However, I also know that if the picture on the poster was a real hamburger I would never even open the box. Ditto for the Weight Watchers’ Risotto. 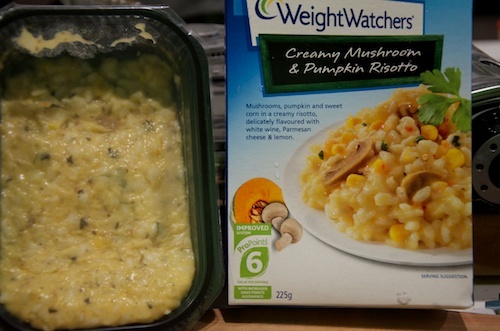 Weight Watchers’ Risotto Inside and Out: the reason why we have food stylists.